NOTE: KSP 1.4 is required for FTP 2.0.0 or later. What is "Fuel Tanks Plus" exactly? Simply, it's a set of fuel tanks that are 1.5x the length of the largest stock tanks in each diameter, plus fuel-filled nose cones for those diameters. 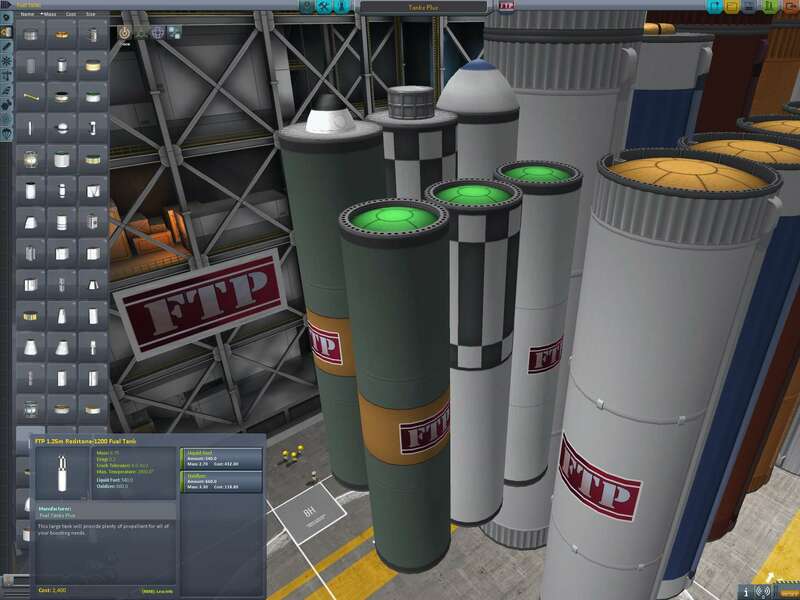 These tanks are meant to give you some visual choice of styles that are loosely inspired by real-world rockets from NASA, ESA, and private space firms (though that inspiration is mainly in color choice), while maintaining the style established in the Color Coded Canisters mod (since CCC replaces stock visuals, any "new" tanks should be spun off into a separate pack, and hence we have FTP). 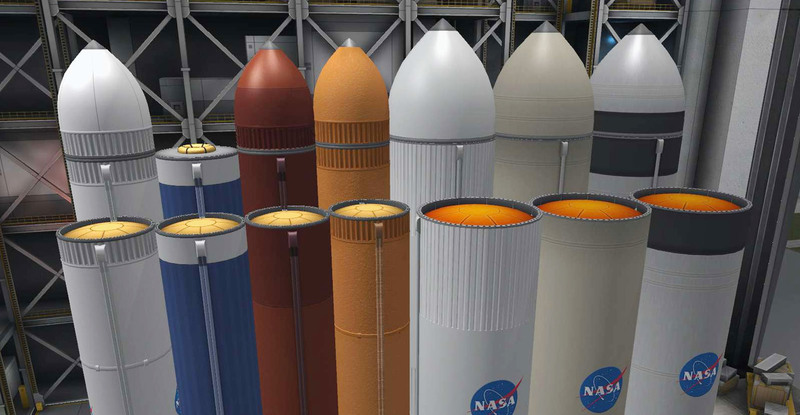 Provide some new visual styles, to dress up the booster sections of your rockets. Help mildly reduce part count and wobble, by providing larger tanks. Be as memory efficient as possible. Each diameter has a shared texture to keep memory usage low. Follow the same colors and artistic style established in Color Coded Canisters. Disclaimer 1: Note that the stats, appearances, and descriptions of the parts shown below are subject to change, or may be out of date. Disclaimer 2: The "Delta IV Heavy" shown in some screenshots below includes parts from several other mods. 1. Everything is installed correctly, but ModuleManager's cache hasn't noticed the changes yet. Fix: This is a great one to try first. Delete the file called "ModuleManager.ConfigCache" in GameData. ModuleManager recreates it on the next KSP start. 2. ModuleManager isn't installed, or is too badly out of date. Fix: Install it, or upgrade it. 3. This mod is installed incorrectly, or you've deleted the color-change ModuleManager configs. Fix: Reinstall the mod correctly, and in its entirety. Fix: Make sure either Firespitter or InterstellarFuelSwitch is installed. The "core" DLL alone is OK, as you only need the functionality it provides for mesh-switching. The entirety of those mods is not necessary. Fix: Make sure Firespitter or InterstellarFuelSwitch are actually working. The version could be out of date and not working, or partially installed, or corrupted somehow. Delete it and re-install with the latest version. - Rebalanced the smaller monopropellant tanks to match their stock counterparts. 2.0.1 (2018-03-13) - Minor fixes. - Removed extraneous IFS/FS/B9 configs from the size-0 tanks. - Altered color/mesh switching to use new 1.4 stock switcher (except the radial tanks). - Note: Saved colors in existing vessels may need to be manually updated or relaunched to correct. - Removed most end-cap shrouds. 1.12.1 (2017-04-09) - MFT fix. - Corrected some MM patch issues for ModularFuelTanks. 1.12 (2017-04-07) - Tweaks & Fixes. - Corrected a typo that was preventing the B9PartSwitch patches from applying correctly on the radial tanks. - Slightly increased the performance of the 2m/3m stack decouplers, and increased their propellant maximums. - Changed ModularFuelTanks config to use consolidated wildcard patch. - Removed "cryogenic" tank type assignments from the MFT configs. - Stack decouplers in sizes 1.25m, 2.5m, and 3.75m collider updates, now actually hollow. 1.11 (2016-10-10) - KSP 1.2 update. - Includes a "Kerbal X Plus" sample rocket, provided by StevieC (untested on my side, so far). - Updated categories for decouplers. - Altered switcher priorities for mesh switching, to match fuel switching rules. - Added color choices from some adjacent diameters to the 1.25m and 2.5m tanks. - Altered the color-switching rules to be based on variables rather than part names, for more flexibility and support for part duplication. 1.9.2 (2016-05-07) - Fuel Switching Tweaks. - Added InterstellarFuelSwitch 2.0.2 flags to re-tie radial tank texture to fuel type. - Reduced dry mass of radial tanks when containing MonoPropellant, to better match stock tanks (Firespitter and InterstellarFuelSwitch). 1.9.1 (2016-05-06) - Fuel Switching Tweaks. - Nuclear (single-propellant) tanks capacity increased to match total units for LFO tanks. Names updated accordingly. - Firespitter and InterstellarFuelSwitch support still included, of course. - Calculated values will differ somewhat from the FS/IFS values, for cost, capacity, etc. This is normal. - Radial tanks with texture-switching still rely on FS/IFS for now. Non-switching if only B9 is installed. - B9 mesh switching has been set not to regenerate drag cubes while attaching in the editors. - Crossfeed available (globally!) for radially attached parts, enable button added to radial tanks. 1.8.3 (2016-04-29) - Hotfix + Tweaks. - Various small clean-ups in the fuel-switching config. - Fixed a mistake in 1.8.2 that was preventing InterstellarFuelSwitch integration from working correctly. - Started on FuelSwitch compatibility with B9PartSwitch, currently mixed module configuration. 1.8.1 (2016-04-24) - KSP 1.1 minor update. 1.8 (2016-04-02) - KSP 1.1 minor update. - Updated included copies of dependencies to 1.1 compatible versions. 1.7 (2016-03-11) Minor fixes, removal of deprecated parts. - Corrected capitalization of "ModularFuelTanks" in the fuel-switching rules. - Added MonoPropellant as a choice for LFO tanks in the fuel-switching rules. - Slightly increased the Oscar-A/C/D dry masses to match mass ratios of larger tanks. - Removed the deprecated parts (deprecated as of FTP 1.0) from this pack. - Still available via optional compatibility pack "Fuel Tanks Plus Deprecated". - These parts were disabled in FTP more than 6 months ago. Deprecation pack only needed for vessels built before then. - Moved ModuleManager patches to a "Patches" folder. - Increased propellant and thrust for 2.5m and 3.75m decouplers. - Sharpened the appearance of the checkered 1.25m long tank (Mercury setting). - Rewrote the fuel-switching config. - Should play more nicely with other mods that affect fuel switching. - Consolidated patches to reduce complexity. - Capacities standardized based on mass, so some values will have changed slightly. - Added "FuelTanksPlus_ATM.cfg" with settings to attempt to disable or dissuade ActiveTextureManagement for this mod. - Can optionally be deleted to return to ATM defaults. - ATM known to occasionally have caching issues with remapped/shared textures in my mods. - FuelTanksPlus is already very memory efficient and uses DDS, so ATM doesn't help much for this case. - May need to delete ATM's cache if using ATM and some textures still aren't appearing. - Replaced some placeholder images with smaller versions that will be more obvious when reassignment fails. - Corrected a typo with Agency mentality. - Added stack decouplers with built-in separation motors, and color-changing capability. - Corrected the fuel-switching capacities for the 0.625m tanks. - Added missing placeholder textures in Size1 category. - Adjusted MM configs so that color switching buttons appear after fuel switching in menus. - Added 0.625 semi-spherical cap tank. - Added 1.25m semi-spherical bottom tank. - Added "half height" monopropellant tanks for 0.625m, 1.25m, 2.5m, and 3.75m. - Minor consolidation in TweakScale configs. - Renamed the 0.625m red variant "Titan", after the thrust vectoring tanks on the Centaur/Titan LOWER STAGE rocket boosters. - Corrected the attachment node size on the adapter fuel tanks. - Moved the 0.625m-1.25m adapter tank to the "Miniaturization" tech node. - Moved the 1.25m-2.5m adapter tank down to the "Fuel Systems" tech node. - Renamed the 0.625m red variant "Centaur", after the thrust vectoring tanks on the Centaur rocket boosters. - Added missing TweakScale settings for 1.25m nose cones. 1.2 (2015-08-31) - Minor update. - Corrected a texture alignment problem with the 0.625m tanks when using reduced texture resolution. - Added new red color option to the 0.625m tanks. - Added a second, shorter 3.75m to 2.5m adapter tank. - Added mod support settings for adapter tanks. - Added TweakScale (adapter) settings. - Added Modular Fuel Tanks settings. - Added Fuel Switch settings. - Corrected the transparent meshes in the FL-T50 fuel tank. 1.1 (2015-08-27) - Fixes, New things. - Added a blue "Delta" variant at the 1.25m size, historically inspired by Delta, Delta II, etc. - Renamed 2.5m colors, to be more historically minded with regards to Delta IV and Delta IV Heavy. - The blue color is renamed from "Delta" to "Blue"
- The orange color is renamed from "Jumbo" to "Delta"
- Corrected the base (dry) mass of the triangular probe tank. - Added 2.5m to 3.75m adapter tank. - Added 1.25m to 2.5m adapter tank. - Added 0.625m to 1.25m adapter tank. 1.0.5 (2015-08-23) - Bug fix. - Moved README and CHANGELOG to mod's folder. - Fixed a problem with one of the RP-400 radial tank's fuel combinations having a dry mass of 125 tons. - Lowered the dry mass of radial tanks for non-monopropellant configurations. - Now including a (disabled by default) Module Manager config for re-enabling deprecated parts in the VAB/SPH. - This should not be relied upon as a long-term solution. - Corrected a mistake with dry-mass of the FLT-50-FTP tank in the fuel switching config. - Will now start including ModuleManager and the InterstellerFuelSwitch folders in the zip archive. - Addressed an issue with the old deprecated parts showing up in the manufacturer's tab. - Added warnings to deprecated parts' descriptions, just in case they show up in a menu somewhere. - Fix for small probe tanks to use InterstellarFuelSwitch properly for appearance changes. - Added more preferential use of InterstellarFuelSwitch over the Firespitter system for all switchers. - Interstellar is now preferred over Firespitter, but either will work. 1.0 (2015-07-17) - Major Overhaul. - Updated to version "1.0" to indicate large-scale overhaul (major version revision). - Consolidated same-size tanks into single menu objects, with tweakables to choose appearance. - Now requires Module Manager and the Firespitter Core as dependencies to function. - Old single-color tanks are deprecated, but temporarily included for compatiblity. - Will not be re-usable in VAB from menus, but saved vessels will still load with a warning. - PLEASE DISCONTINUE USE ASAP, from both saved vessels and deployed vessels in the world. - Replace with new versions from the menus, to use the new features. - These will be removed in a subsequent update, eventually. - Added color options to tank sizes that were "missing", now that the options no longer spams the menus. - Fuel switching turned on by default. - Will still use Interstellar Fuel Switch if available, otherwise defaults to FSfuelSwitch. - Radial canister tanks switch fuels with color selection. - Small "probe" tanks now have choices between LFO, Xenon, or Monopropellant. - "Nuclear" tanks now have LF, Oxidizer, Monopropellant, and Xenon options, but remain single-propellant tanks. - Various minor mesh/texture fixes. - Restored flag and agency icons to PNG format instead of DDS. 0.11.2 (2015-07-06) - Minor update. - Corrected a mistake in Modular Fuel Tanks config for the cube tanks. - Added an optional "FuelTanksPlus_RemoveShrouds" ModuleManager config. To disable auto-shrouds, change from "txt" to "cfg". 0.11.1 (2015-06-14) - One more tank! - Added white 3.75m 2x tank. - Added missing MFT/IFS configs for the 3.75m nuke tank. 0.11 (2015-06-12) - New things. - Added support for Modular Fuel Systems (Modular Fuel Tanks). - Added support for Deadly Reentry. - Added white and orange double-length 2.5m tanks. - Added 3.75m nuclear (LF-only) tank (one length for now). - Reconverted textures to DDS format (again). 0.10.1 (2015-05-28) - Appearance tweaks. - Altered sheen/specular on nuclear LF tanks, and size 3 "silver" tanks. - corrected a mesh mistake on the 2.5m nuclear tanks. 0.10 (2015-05-22) - More tanks. - Added a pair of 1.25m nose cone fuel tanks. 0.9.1 (2015-05-19) - Hot fix. - Fixed Interstellar Fuel Switch config for S3-10800 tank. - Re-balanced the Oscar-like tanks to correspond to the Oscar-B changes. - Adjusted Interstellar Fuel Switch config to not load if CryoEngines is installed (so Cryo can do the right thing). - Added LF-only tanks (1.25m and 2.5m) for use with nuclear engines. - Tweaked attachment node priority order on many tanks for easier attachment in the VAB. - Changed the "fuel switching" configs to support Interstellar Fuel Switch. - Corrected the S3-2400 Titan nose tank to be in Large Volume Containment tech node. - Converted textures to DDS format. - Corrected Xenon options for Fuel Switcher. - Increased scale of "triangular" tanks by 25% to make them align nicely with the small cubes. - Corrected fuel capacity of the FL-T50 fuel tank. - Corrected the attachment node size for the 3.75m nose cone tanks. - Added "bottom" dome parts for external tanks, in both 2.5m and 3.75m. - Added FL-T50 fuel tank. - Adjusted normals (light/shadow angles) on many of the fuel tanks. - Three LFO "cube" tanks in varying sizes. - Two "triangular" tanks, one with LFO and the other with Xenon. - Added support for Fuel Switcher. - Fixed the cap-shrouds to be hidden from the menu icons for the 1.25m tanks. - Changed TweakScale config to use wildcards instead of duplicating settings for every tank. - Altered appearance of the grey "Oscar" 0.62m tank to have fewer ribs. - Renamed most tanks to have better name sorting alongside the stock tanks. - Mildly increased torque/breaking strength on 1.25m, 2.5m, and 3.75m cylindrical tanks. - Added three more 0.625m "Oscar" tanks in several sizes, with a spread of mass/fuel/size ratios to fill the gaps. - Added Orange/White 2.5m and 3.75m tanks that are 3/4 the length of the longest stock tanks in those sizes. - Added white 2.5m and 3.75m tanks that are half the length of the smallest stock tanks in those sizes. - Added three 0.625m tanks. - Removed excess oxidizer from fueled nose cones. 0.2 (2015-01-28) - More tanks! - Added three 1.25m tanks. Interesting ! Glad to see you can't stop ! Very nice and where did you get the launch clamps ? Ah, those are part of SpaceY. Waw those nose cones are really nice, thanks. Very nice! Are those larger ones in the album 3.75m in diametre? Yep, currently it has tanks in 2.5m and 3.75m. I can't turn around without you creating something really awesome that I MUST add to my KSP game. Will You by any chance make some tanks that are 1.25 meters in diameter for this pack? Because I like the blue tank very much, what was your inspiration for that tank? I know, NASA and ESA, but which rocket in general? Yep, I'll probably add 1.25m tanks as well, if there's enough interest. I felt I needed to get a good range of 2.5m and 3.75m first, for the pack to be useful. I had the Delta II in mind when I did the blue tanks. The shade of blue isn't quite the same, though. to tell the truth, I wasn't too impressed by the texture work on MRS, but you just keep getting better and better! They seem to work fine with RF right out of the box. They're considered 'Standard' tanks in Real Fuels, no insulation. It's interesting that you say that. MRS has an odd mix, in that I was learning Blender from scratch during a good part of that. Some of the parts are the way they are because I didn't know how to do it better. But part of the design goal was also to have the sort of stock "low res" feel to them, even if they don't share the style directly. But yeah, when I moved on to other mods, I felt the "training wheels" were off and it was time to do better. EDIT: Duh, it's TweakableEverything that toggles the 'fairings'.. still though, that means using engines with no boattails (like Vens Revamp) can have direct access to the actual tank like they should or I can close them off if needed. That makes it even better as I have even more choice! Hooray! So thanks to you again! NecroBones, these are realy cool. Personally I think you should be able to toggle them in stock too (feature request idea?). At least Stock lets you jettison fairings via the GUI. But yeah, having options is always great! These tanks are really nice! Could you possibly consider creating a set of textures for for Procedural Parts or sharing textures sources so I gladly would try to take care of it? Huh, cool idea. The good news is that I didn't really do anything fancy or complicated with the textures. I'd have to see how the procedural parts texturing works, which I'm assuming relies on looping/repeatable textures (which these aren't currently). Yes, I should probably add a disclaimer for that. Is there away to make some Shorter one's to use for upper stages ? What is the wet/dry mass ratio for these tanks? The 1.25m (FL-T800) and 2.5m (Rockomax X200 series) are both 1:9 (dry/wet). Are these exactly 1:9 or are they slightly better? Possibly, I haven't decided what to do here yet. Maybe some of the more interesting colors could have half-length versions or something. Otherwise, if it's the white/grey sort of colors you're interested in, the Color Coded Canisters mod replaces the models/textures on the stock tanks and makes them look similar to these. Right now they preserve the stock balance by maintaining the same ratios as the stock tanks in those diameters. That is, the 1.25m and 2.5m tanks maintain the 1:9 ratio, and the 3.75m tanks are based on the KD S3-14400, and have a ratio of 8.2:1.